The cloud service provider expands its communications ecosystem again. Twilio (NYSE:TWLO) recently agreed to acquire SendGrid (NYSE:SEND), a cloud-based email services provider that went public last year, for about $2 billion in an all-stock transaction. This marks Twilio's biggest ever acquisition, and it's expected to close in the first half of 2019. SendGrid will become a wholly owned subsidiary of Twilio, and its outstanding shares will be converted to Twilio stock. Twilio's bid, which equals about $36.92 per share, represents a 131% premium to SendGrid's IPO price of $16 per share. $2 billion seems like a lofty price tag (14 times sales) for a company that is expected to generate just $144 million in sales this year; however, Twilio itself trades at 13 times this year's sales. Twilio CEO Jeff Lawson called the deal a "a once-in-a-lifetime opportunity to bring together the two leading developer-focused communications platforms to create the unquestioned platform of choice for all companies looking to transform their customer engagement." Should investors cheer on this deal or exercise caution? Twilio provides a cloud-based platform that processes text messages, voice calls, video calls, and other communication features for mobile app developers. In the past, developers built these features from scratch, which was time-consuming, buggy, and tough to scale. By integrating Twilio's API (application programming interface) into their apps, developers can simply outsource those features to Twilio's cloud platform. Twilio has a first mover's advantage in this space, and it serves a growing list of major customers, including Facebook, Amazon, and Airbnb. However, Twilio also faces growing competition from smaller challengers like Vonage's Nexmo and Bandwidth. There's also the possibility that its bigger customers could start developing Twilio-like features in-house to cut the company out of the loop -- as Uber, once its top customer, started doing last year. To counter those challenges, Twilio has been expanding its ecosystem of cloud services with new streaming video, cybersecurity, and enterprise tools. That's why it acquired Authy (a two-factor authentication firm), Beepsend SMS, Kurento (an open-source development framework), and Ytica (a cloud-based workforce optimization software provider for contact centers) over the past three years. The acquisition of SendGrid further expands Twilio's ecosystem to include emails. Twilio's main strategy is to cross-sell those services to boost its revenue per customer while locking them in. It measures that growth with its "dollar-based net expansion" metric, which rises when active customer accounts "increase their usage of a product, extend their usage of a product to new applications, or adopt a new product." Here's how quickly Twilio's dollar-based net expansion rate climbed over the past four quarters. YOY growth. Source: Twilio quarterly reports. Those figures tell us that Twilio is locking in plenty of customers with its new services, and that the rate accelerated significantly over the past two quarters. That's why analysts expect Twilio's total revenue to rise 48% this year, compared to 44% growth in 2017. However, they also expect that rate to decelerate to 28% next year -- which explains why Twilio is pursuing inorganic growth. Analysts expected SendGrid's revenue to rise 29% this year, and another 25% to $179 million next year. SendGrid's revenue estimates for fiscal 2019 would lift Twilio's total growth rate to 58%. Twilio states that the combined company would serve "millions of developers" and over 100,000 customers. Twilio didn't reveal any additional forecasts for the deal, but it announced that both companies had already exceeded the third quarter guidance numbers that they previously provided. For reference, Twilio expected its third quarter revenue to rise 50% (at the midpoint) to $151 million, with a slim non-GAAP profit from operations of $1 million. SendGrid expected its third quarter revenue to rise 27% (at the midpoint) to $36 million, with a non-GAAP net profit of $1.5 million. Neither company is profitable on a GAAP basis, partly due to stock-based compensation expenses. 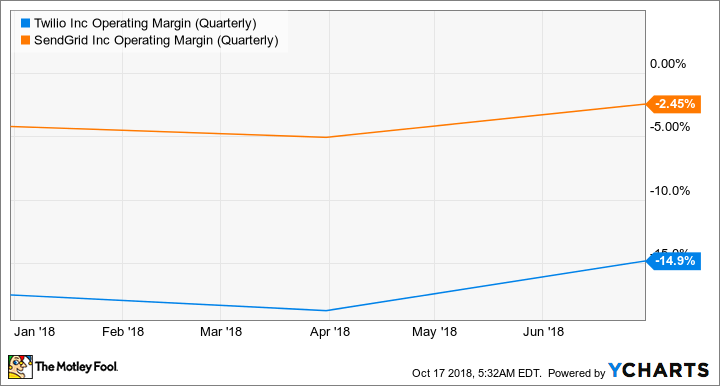 However, merging the two companies could boost Twilio's operating margins -- SendGrid has higher margins, and the combination of the two businesses could eliminate redundancies at both companies. Twilio's takeover of SendGrid was a smart move, and it should help the company expand its ecosystem, widen its moat against its rivals, and boost its top and bottom line growth. The takeover was expensive, but it was wisely done with stock instead of cash -- so it shouldn't significantly dent Twilio's cash flow.